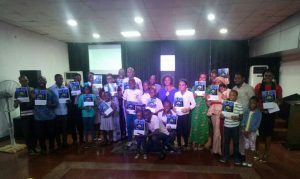 The maiden edition of the “Raising Timothy Family Conference” help in Abuja on th 27th of May, 2017. The conference featured several speakers who treated various important topics realated to raising children who will have a successful future. Raising Timothy is an initiative of Wisdom Impact House to call the attention of the society to the need t invest more resources to child upbringing in order to guarantee a better future for society. The future belongs to the children. What kind of adults are raising them to become? Prof. (Mrs) Esther A. Adelakun: A grandmother and Professor of Chemistry from University of Jos. She spoke on the role of Christian Women in Child upbringing. Mr Obi Brown: An education entrepreneur and CEO of Insight Africa. He spoke on “Educating Timothy”. Mr Olusola Adeyemo: A technical lead with “Save the children, Nigeria”. He spoke on ” Protecting Timothy”. Mr Olajide Abiola: An entrepreneur and Co-founder of KiaKia. He spoke on “building an entrepreneurial mindset in children”. 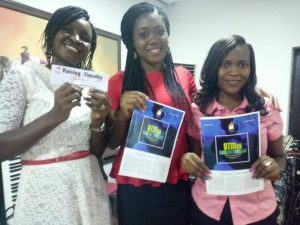 Excerpts from the talks can be found on www.facebook.com/raisingTim . Check back here for more robust summary of the talks soon. Drop your email here to be notified when they are available. 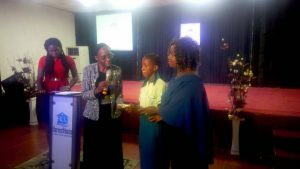 Miss Obetta gift, a JS2 student of JSS Kubwa 2, Abuja, emerged the winner of the RTFC 2017 Essay competition. She is pictured below receiving her prize along with her teacher. Miss Obetta receiving the price for the best Essay.